Amidst the fallout of the Democrats’ manufactured outrage over U.S./Russia Summit and the presser with Russian president Vladimir Putin that followed, President Donald Trump has received widespread criticism over his initial rejection of the Russian meddling narrative. Even as President Trump attempted to “clarify” his comments, making a brief closed-door address to a handful of Republican members of Congress, the Washington political despots are still not satisfied. Nothing less than total and complete capitulation is acceptable. There will be no deviation so says the likes of Sen. Chuck Schumer (NY-D) and Sen. Nancy Pelosi (CA-D) who held their own press conference, demanding the release of any and all notes taken during the private meeting held between President Trump and Putin. “We need to know this because as frightening and damaging as the president’s comments were to the public in Helsinki, what he said behind closed doors is in all likelihood even worse,” he added. It seems President Trump and his refusal to accept the narrative that Russia tried to influence the 2016 presidential election the American intelligence community is attempting to push is highly troubling. 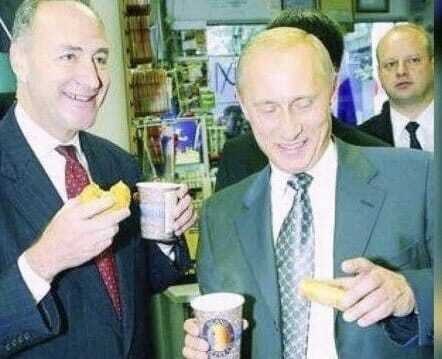 Yet it seems Schumer himself has some answers to give regarding pictures that have surfaced from 2003 showing Schumer sharing donuts with Putin. The picture in question was taken in 2003 as Russian President Vladimir Putin, right, enjoys a Krispy Kreme doughnut and coffee with Senator Charles Schumer from New York as Putin visits the first New York gas station of the Russian company Lukoil. Trump even tweeted about it last year. And someone made this hilarious video compilation of Schumer & Putin to the tune of “You’re My Best Friend” by the rock band, Queen. The picture originally surfaced back in March 2017, as the Gateway Pundit reported, Democrat Senate Minority leader Chuck Schumer continues to push the Russia conspiracy… But it was Schumer who met with Putin in New York City – not Trump. Yet Schumer continues to attempt to dismiss the picture as something perfectly rational, while he projects onto President Trump all manner of “crimes” in connection with Russia. And Schumer still has not provided an explanation not concocted from public relations or the Hillary Clinton herself. House Democratic leader Nancy Pelosi (CA), Minority Leader of the US House of Representatives, declared that out of fear of some undefined retribution from Putin, a dossier on Trump perhaps, the President of the United States sold out the American people to Russia because he wants to make peace: “It begs the question, what does Vladimir Putin, what do the Russians have on Donald Trump – personally, politically and financially that he should behave in such a manner?” The “such a manner” Pelosi is speaking about is making peace instead of war. To be clear, the Democratic Minority Leader of the US House of Representatives has accused Donald Trump of high treason against the United States. There is no outcry against this blatantly false accusation, totally devoid of evidence. Just to review boys and girls, the word of the day is TREASON, strictly defined as “the crime of betraying one’s country, especially by attempting to kill the sovereign or overthrow the government.” This is synonymous with treachery, disloyalty, betrayal, or faithlessness. Treason is selling Putin our uranium. Treason is purchasing a fraudulent dossier which was connected to the Kremlin. Treason is giving billions of dollars to Iran. Putin from today’s summit – “I was an intelligence officer myself, and I know how dossiers are made up,” suggesting the Steele dossier was fake.